Congress President Rahul Gandhi addresses a public meeting in Bhavnagar, Gujarat. Rahul Gandhi has been busy in promoting Congress' NYAY scheme in a bid to woo voters in Lok Sabha election 2019. And while the BJP has accused Congress of having no plans of how it would give money to people below the poverty line if it forms the government, Rahul said on Monday that alleged economic offenders Nirav Modi, Vijay Mallya and Mehul Choksi would foot the bill. 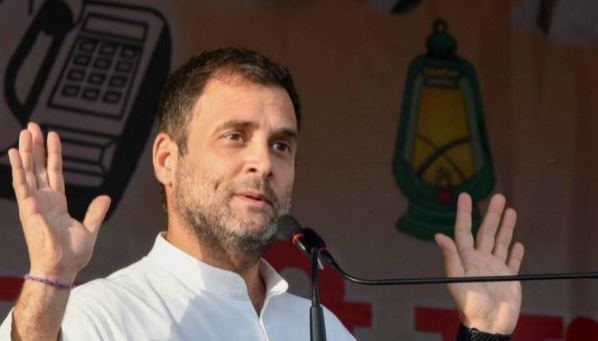 In what is being seen as an assurance to make the three pay what they owe Indian banks, Rahul said that the NYAY scheme is fool-proof and that money from recovered from economic offenders would be used as funds - either in part or completely. "Money for 'Nyay' scheme from pockets of people like Choksi, Nirav Modi, Mallya," he was quoted as saying at a rally in Gujarat.